Jess gave me a little pre-baby shower gift last night. 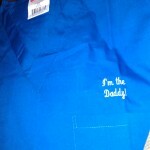 It was a blue smock that says “I’m the daddy!” on it to wear in the hospital. No idea where she came up with this but it is an awesome idea! I love it! Now I’m really prepared for all the lovely potential fluids I get covered in. This was funny timing too because just a few days ago a little something I bought her for the shower came in and I gave it to her as well. I gave her a Rangers maternity shirt with matching onezie and bib! Just funny how well in sync we are. Didn’t even discuss getting each other a gift but they show up 2 days apart. Apple Pie Season Is Back!